The room was spacious and comfy. Our dog was comfortable a relaxed three nights there. The food was fabulous including some very different ideas for breakfast yum yum. The staff where all lovely and helpful. The breakfasts were cooked to order and were delicious. Friendly staff. Quaint old property lots of character. Beautiful old building great surroundings, friendly staff and the food was excellent. Only downside was attention to detail could have been better. Ie menus weren’t ready when we went for breakfast at 9.00am and tea/ coffee hadn’t been replenished in the room on arrival but both were sorted for us. Would definitely revisit. The room was lovely and warm, the food very good and the staff very friendly and accomodating. It was also very good value for money and convenient for where I needed to be the next day. Food excellent. Very friendly staff. Very welcoming to our 2 dogs which was a bonus. Situated in Buckinghamshire, a 10-minute drive from High Wycombe, George and Dragon Hotel has free Wi-Fi and free parking on site. Originally an 18th-century coaching house, its entrance is through a cobbled archway on West Wycombe’s High Street. Rooms at George and Dragon Hotel are traditionally furnished, and each benefits from an en suite bathroom and a flat-screen TV. Many have picturesque views of the courtyard or surrounding area. There is a large garden for guests to relax in, and delicious food is served in the restaurant. Full English breakfast can be enjoyed each morning, and for lunch and evening meals you can try local game or traditional English cheeses. Central Oxford is 25 miles from the building, while Heathrow Airport can be reached in just 30 minutes’ drive. 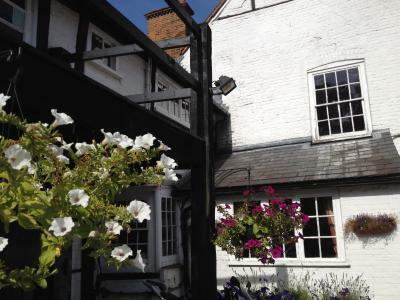 George and Dragon Hotel, West Wycombe has been welcoming Booking.com guests since 26 Sept 2012. When would you like to stay at George and Dragon Hotel, West Wycombe? Features include an en suite bathroom and a flat-screen TV. With a king-size bed and a chaise lounge, this room offers views over the village. House rules George and Dragon Hotel, West Wycombe takes special requests - add in the next step! George and Dragon Hotel, West Wycombe accepts these cards and reserves the right to temporarily hold an amount prior to arrival. Our booking hadn't included our dog although we had booked him on line but this wasn't a problem with them. Bedroom needs updating floor very creaky.A bit pricey for the food as there’s nowhere else to eat in walking distance.I found the food myself to salty but that’s my opinion but my wife liked the food. Food a little on the expensive side and not much of a selection. The bed linen and towels were fine but the furniture and fittings were a little tired. It was a quirky historical place. The staff were lovely and helpful. The noise of the kitchen fans, the smell from the kitchens. Poorly lit bathrooms. Texted property to request a vegan breakfast and they replied this was no problem. After requesting and checking again on arrival that this was fine unfortunately the next morning there was a very limited selection which was quite disappointing considering it could have been done easily. Room not made up in room no milk for tea in the room. Furnishings very 1980s lots of pine. Bed sloped backwards so feet higher than head, needs blocks under the head end to level. Refurbishment amateurish e.g. wallpaper poorly fitted. No heat in shower room. Parking tricky as access via original, narrow coach entrance on very busy road.